With over 25 years of experience in the Barnsley area, we recognise that you demand two things from a double glazing or conservatory company: firstly, we know you want a fair, honest price; and secondly, you don’t want to receive the hard sell from a pushy salesman. Across Barnsley, we supply beautiful double glazing, doors and conservatories without confusing or misleading discounts. You get our best available price, without the jargon. We don’t employ salesmen either. Our surveyors will handle your enquiry, and will ensure a smooth process, from initial contact to finishing the job. Call us today and hear why we are different. All our work is bespoke, and is completed with great attention to detail by our professionally trained, in-house tradesmen. 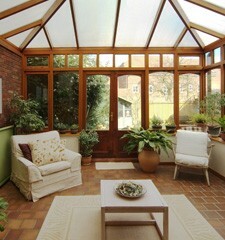 We will bring together your garden and home with a beautiful, stylish conservatory. Alternatively, you could opt for show-stopping bi-folding doors that flood rooms with natural light. Speak to us right now about our range of services. Call for free on 0800 011 4195.